The Definitive Angle is PRO’s analysis of the week’s Video Review use in MLS. This weekend there were six Video Reviews where the VAR stepped in to rectify several important situations. One review was unnecessary as the on-field decision was not a clear error and the referee rightly retained his original decision in the New York Red Bulls vs Minnesota United game. Finally, the referee in the game between DC United and Los Angeles Football Club incorrectly did not show a red card for DOGSO after the VAR recommended a review. 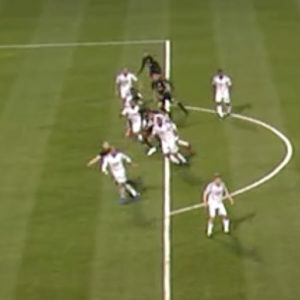 As a reminder of Law 11, only the parts of the body that can be used to score a goal count for offside position, thus, for example in Columbus, Josh Williams’ arm is clearly ahead of the defenders, however you would need to determine if the shoulder or head was clearly ahead of the shoulder, head or body of all of the defenders, including that of Brandon Bye (NE) who is further across the penalty area. Although it is easier to make the assessment to the player nearest to him, it is less clear when you compare Williams with Bye. The only goal of the game was scored by Josh Williams (CLB), who headed an in-swinging wide free-kick past goalkeeper Cody Cropper (NE). At the moment that the free-kick was taken by Federico Higuain (CLB), Williams was close to and possibly very slightly ahead of Teal Bunbury (NE). The footage suggested that a small part of his body and head were ahead of Bunbury. Further across the penalty area, approximately eight yards away, was Bye (NER), who was very close to being level with Williams. Due to the lean of Williams, it appears that he might be marginally offside in this situation but the assistant referee gave the benefit of any doubt to the attacking team and kept his flag down, and the goal was awarded. The VAR checked the footage using the 18-yard line camera, which provided the best angle. Due to the situation being so close, the VAR decided not to recommend a Video Review. VARs have been instructed to only step in when the on-field decision is clearly wrong. Although this type of situation creates a dilemma for the VAR as to whether the images support a ‘clearly wrong’ decision, it is so close that we support the non-intervention, especially based on the advice that we have given for VARs not to recommend a review when the situation is so marginal and there is any doubt. A goal was scored by Nick Lima (SJ) and awarded by the on-field match officials. The VAR identified an offside offense in the attacking phase of play (APP) when the ball was played to Cristian Espinoza (SJ), who in turn controlled and passed the ball as part of the attacking move. The position of Espinoza’s left foot looks clearly offside, using markings on the field of play as a guide. The nearest defender Bill Tuiloma (POR) is relatively nearby and although he is leaning a little forward and the camera angle isn’t perfectly in line, the visual evidence, in this case, is sufficient to support the judgment made by the VAR. The referee, having looked at the footage in the RRA, canceled the goal and awarded an indirect free kick to Portland Timbers. This was a good use of Video Review. What Happened: The foul which resulted in the award of a penalty kick to FC Cincinnati was committed by Andreu Fontas (SKC). The referee initially showed the yellow card to Sanchez (SKC) in error. The VAR used Video Review to rectify this error, advising the referee as to who had committed the offense. The referee canceled the yellow card for Ilie and correctly awarded the card to Fontas. Within a few seconds, the VAR confirmed the penalty kick decision. They begin to check the APP for possible offside on the original pass – Right 18 was the only camera that captured the attacker on screen. Check is made to see if the goalkeeper had handled the ball outside the area. Referee is informed that the check is complete on the penalty, the offside and the possible handling by the goalkeeper. The referee asks if he can confirm the yellow card to #6 for the foul. The VAR quickly takes a look at the foul again and responds that it is #4. PRO’s Decision: In the heat of making a decision the referee can miss-identify which player committed a foul when two players are in close proximity and VAR can serve as good backup to get it right. VARs must verify every yellow card given as part of best practices. In this case, the referee correctly used the system to verify the number of the player and correctly gave the yellow card to the right player. What Happened: A challenge by Maximiliano Urruti (MTL) on Maxime Chanot (NYC) was penalized by the referee, who issued a yellow card to Urruti for the challenge, which he deemed to be reckless. The VAR could see that the studs of Urruti’s right foot came down with force onto the left calf of Chanot. The referee looked at the footage in the RRA and changed his initial yellow card decision to a red card. PRO’s Decision: This studs-first tackle is serious foul play, and there is sufficient force for it to be a clear red card. The referee correctly showed the red card. This was a good use of Video Review. What Happened: Bradley Wright-Phillips (RBNY) went down in the Minnesota United penalty area under a challenge from Brent Kallman (MIN). The referee allowed play to continue. The VAR saw some contact from Kallman on Wright-Phillips and therefore recommended a Video Review. The referee retained his original non-penalty call. The Video Review Process: On the VAR’s first viewing of this incident he looked at the Right 18 camera which appeared to show that Kallman played the ball. He then went to a second angle Tight where it was evident that Wright-Phillips had played the ball first and then Kallman had made contact with Wright-Phillips and did not play the ball. Based on that angle he recommended a review. In the video, you will notice an error message popped up on the screen every five seconds. There was a software glitch during that portion of the match that was being rectified. However, it was not enough of an issue to affect the Video Review process. PRO’s Decision: Although Kallman doesn’t play the ball and there appeared to be some contact from Kallman on Wright-Phillips, it is minimal and Wright-Phillips appeared to go down very easily. Although subjective in nature, the non-penalty call, in this case, is credible and was not a clear and obvious error and serves as a reminder that the referee always will make the final decision. What Happened: Wayne Rooney (DC) was in possession of the ball near to the halfway line when challenged by Eddie Segura (LAFC). Segura made two small contacts on Rooney, the second of which the referee decided to penalize. However, as the referee was about to blow the whistle to stop the game, Rooney made a lunging, studs-first challenge on Diego Rossi (LAFC). His studs made contact on Rossi’s leg above the ankle. The challenge had speed and intensity, and involved excessive force. Initially, the referee issued a yellow card to Rooney for what he deemed to be a reckless foul challenge. The referee viewed the footage in the RRA and issued a red card to Rooney for serious foul play. 10 seconds after the tackle the referee announced that he has a yellow card for Rooney. The VAR has already looked at the tackle twice in full speed. The VAR selects Tight and Low Mid as his two best angles and watches the tackle three times in slow motion. Once the yellow card has been shown the VAR recommends a review – this was delayed slightly due to the referee still dealing with the players. The referee views the Tight angle three times in full speed and then twice in slow motion. PRO’s Decision: There is no doubt that Rooney’s actions were worthy of a red card, and this was a very effective use of the Video Review system. 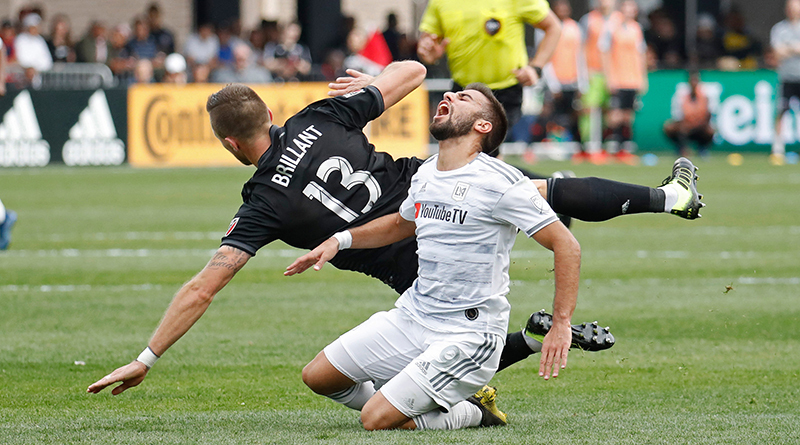 What Happened: A foul was committed by Frederic Brillant (DC) on Rossi (LAFC), who was running onto a long ball over the top of the DC United defense. 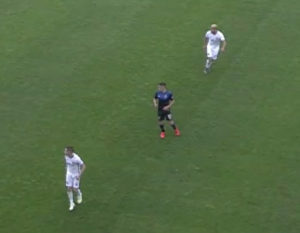 After Rossi had headed the ball forward into space approximately 15 yards outside the DCU penalty area, and with a clear run to goal, he was knocked to the ground by Brillant. The position of the foul was slightly left of goal, however, the nearest defender was some distance away behind play and the goalkeeper was still backing off when the foul happened. An obvious goalscoring opportunity existed which was denied by the foul by Brillant. The referee penalized the foul and showed a yellow card for stopping a promising attack. The VAR recommended a Video Review for a possible red card for DOGSO. PRO’s Decision: This was a correct recommendation for review. The referee looked at the footage in the RRA but retained his yellow card decision. This was the incorrect outcome.